Piotr Naskrecki is very much a man after my own heart; he likes small things. 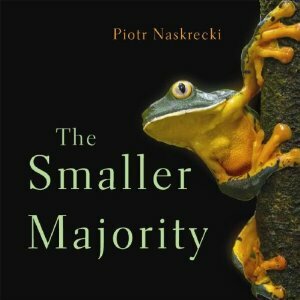 In this book, The Smaller Majority, he takes you on a journey through the world that lies all around you but not so often explored. It is a world that is not hidden; it just requires a change in perception and perspective to bring it to the fore. Most people when they visit a new area or the first time whether it be visiting a country or a previously unfamiliar habitat such as a desert, coral reef or rainforest, they see the big picture. The cities are new and exciting, the people are exotic and there may be so many strange plants and animals. Your senses can be overloaded with experience of the unknown. After a period of time though, if you start to look closer, you will find a myriad of fantastic and amazing forms of life right in front of your eyes, life that we sometimes take for granted and may even consider pests; insects, arachnids and fungi. Piotr Naskrecki takes us into this small world with the aid of some spell binding photography. Through his lens we get to view at close quarters so many animals that would normally remain hidden from our sight. 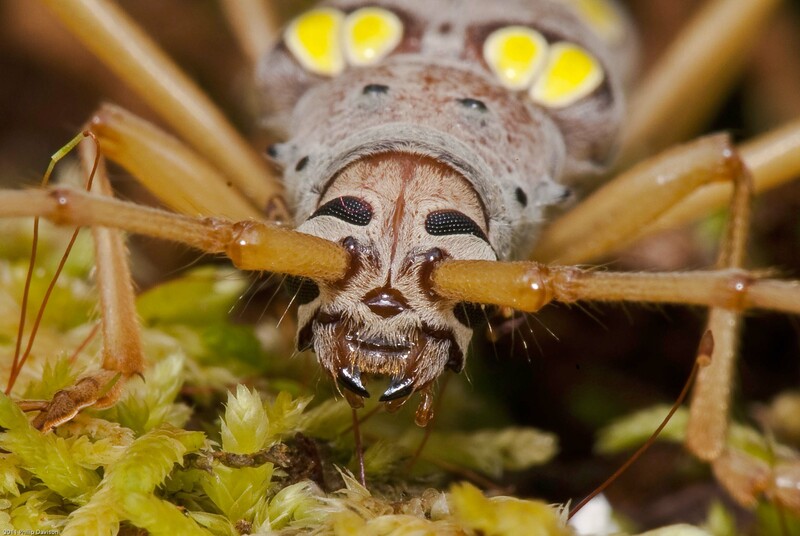 The book is lavishly illustrated with macro photographs of crabs, frogs, beetles, katydids, (he has a special interest in katydids), spiders, ants and butterflies. The expertly written text provides a compelling insight to the natural history of these animals. Piotr has a lifelong interest in his subject and that is reflected in the prose. He is also a scientist but his style is not dry, rather eloquent and entertaining. He has also been fortunate to pursue his studies and photography all over the world providing a wonderful cross section of small life forms inhabiting rainforests, savannahs and deserts. There is a small chapter at the end of the book that details equipment and techniques to help you enter the small world for yourself. All in all, a thoroughly enjoyable book which once you have finished reading it will sit as an attractive coffee table book enticing other readers to enter a world that they not have realized existed. I would recommend the Small Majority to anyone, familiar or not with its subject matter as a first step into this microcosm. Philip is a biologist, writer and photographer as well as the onsite naturalist guide at Bosque del Cabo Rainforest lodge on the Osa Peninsula, Costa Rica. January is the time when we see blue skies almost every day at Bosque del Cabo. There is still a little rain but for the most part the days are clear and bright. The forest floors are starting to dry out significantly and small cracks appear as the relatively thin soils lose their moisture content. The vegetation however continues to retain its post wet season verdant coloration. Now a lot of the plants are in bloom. Flying into Puerto Jimenez from San Jose, as you cross over the Osa Peninsula, you will see the multifarious colors of blooms that cannot be seen from the forest floor, at least not until they fall to the ground, at which point they will have faded to a shade less vibrant than in the canopy. 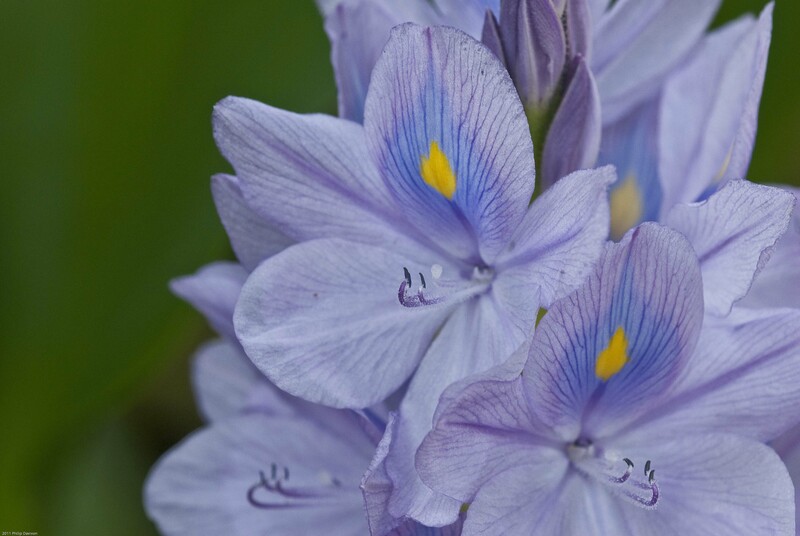 This is a good time of the year to see the orchids bloom, but as most of Costa Rica’s orchids are epiphytes growing on the uppermost part of a tree trunks and branches then that is where you will have to be to see them. The air will be pervaded by various strange odors, some of which you would not always attribute to flowering plants. The January forest air normally hangs heavy with the scent of garlic. The bright yellow flowers of the Garlic Tree, (Caryocar costaricensis), are the source of that scent. Bats are very important pollinators and seed dispersers in a tropical rainforest and rather than being attracted to sweet smells, they prefer those musky smells that are prevalent now, one of which is that garlicky odor that attracts the nectar feeding bats. The year started for me in a somewhat exciting manner. 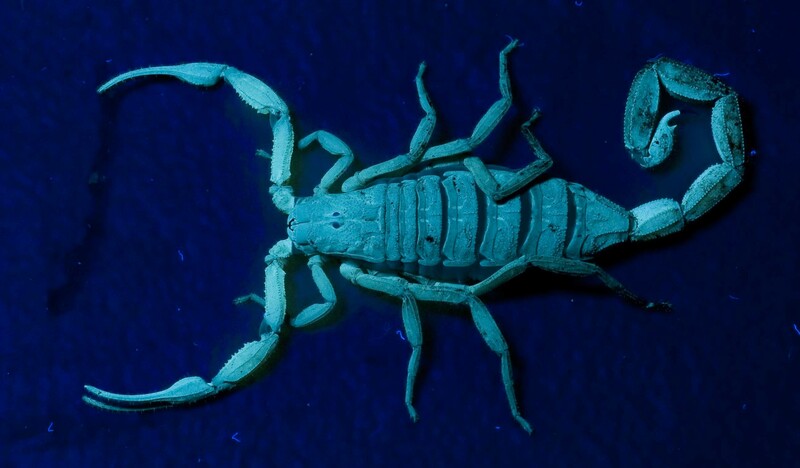 On the night of the first, when I returned to my cabin, I found a Bark Scorpion on the wall, low to the ground. I illuminated the scorpion with the black light and set the camera to a 30 second exposure @ f/16. The creature did not move at all and so I managed to obtain a nice image of the fluorescence from the exoskeleton that scorpions are famed for when exposed to ultraviolet light. As ever beetles are there if you look. Here is another couple of Longhorn species that I managed to get close up to. The Hooded Mantis, (Choeradodis sp), makes an excellent photographic subject. 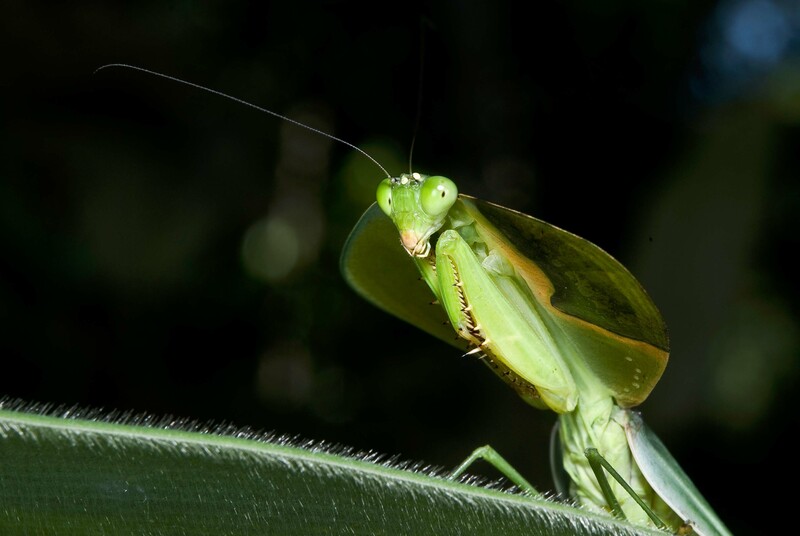 Mantis’s have a habit of turning the head to look at you and the structure of the eye gives the impression, a false one, that the eye has a pupil. It is similar to the concept of the eyes of a portrait that follow round a room. Photographed from beneath the insect, the eponymously expanded thorax adds extra character to the picture. 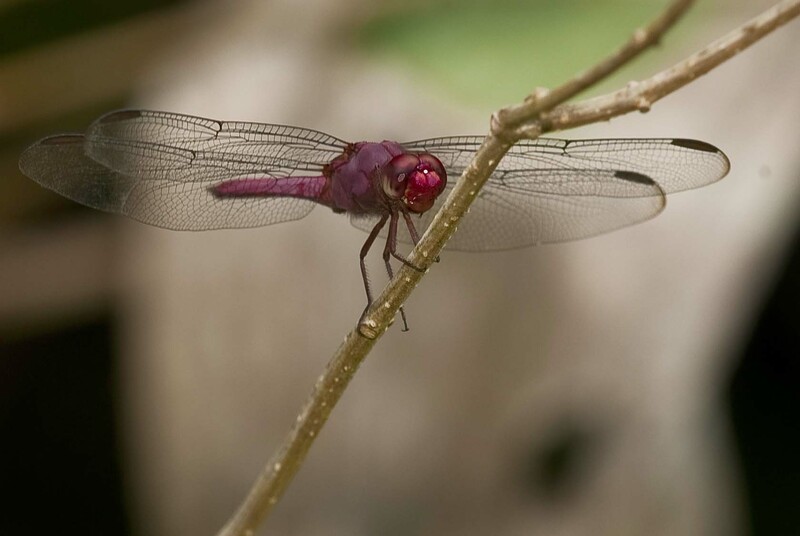 If you take a short walk down to the pond you will see several species of dragonfly. Each individual has its own perch and if disturbed and then left for a short period of time, it will return. 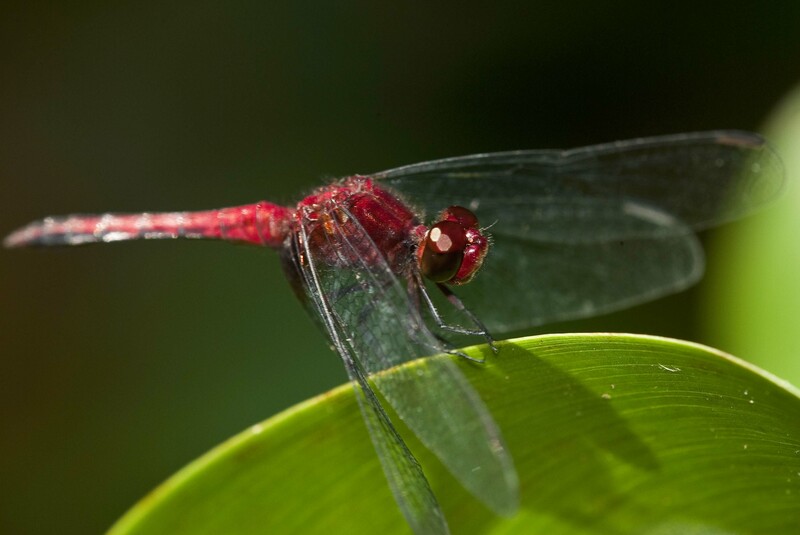 Just like butterflies, dragonflies are very sensitive to movement, so if you want your photograph, sit still, have the camera set and when it re-alights, just hit the shutter button. The butterflies have now started to appear in larger numbers. Only a few yards further down the path from the pond is a patch of Lantana camara, a native bush with orange/yellow flowers that certain species of butterfly such as the longwings find irresistible. 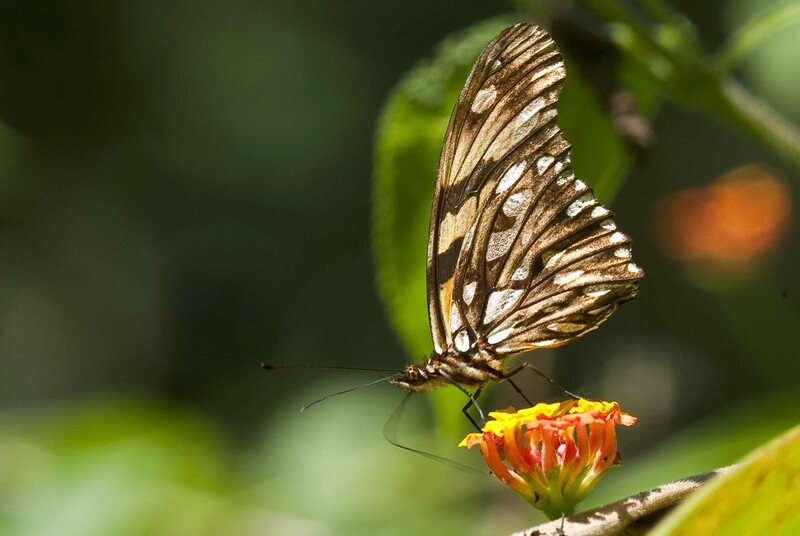 Unlike the dragonflies, which when perched, tend to stay in that position for a while, the butterflies are continually moving. The best policy here is to choose a blossom and then keep and eye on any approaching individual which may then visit several blooms on the same flower head. You will need a faster shutter speed and maybe some flash to freeze the motion. If you are lucky the individual will settle for a second or two but don’t count on it being any more than that. 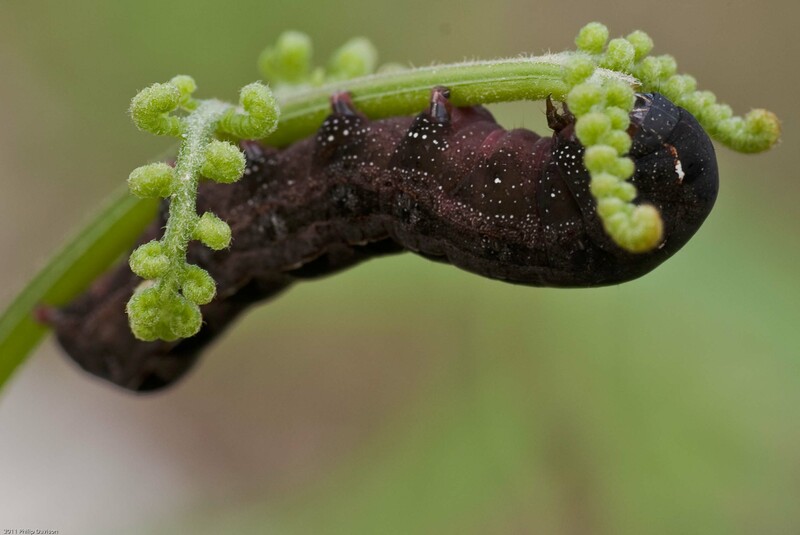 The adult butterflies may be easy to locate but in my experience, the larval form, the caterpillars are not. Many caterpillars are beautifully and subtly colored. As so many of the caterpillars I do find are those of moths, they remain just that, unidentified moth caterpillars. There are some though that do stand out quite markedly. The green caterpillar is that of a very indistinct little brown moth, the Saddleback Moth, (Sibine stimulea). 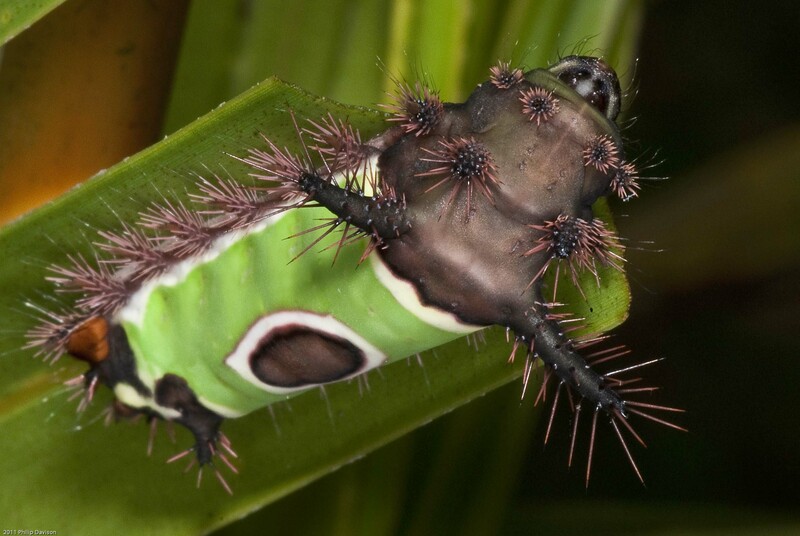 The caterpillar is found on the undersides of some broad leaved shrubs such as the Calathea. It is armed with an array of urticating spines, bristles and hairs that cause a severe rash even with the slightest touch. 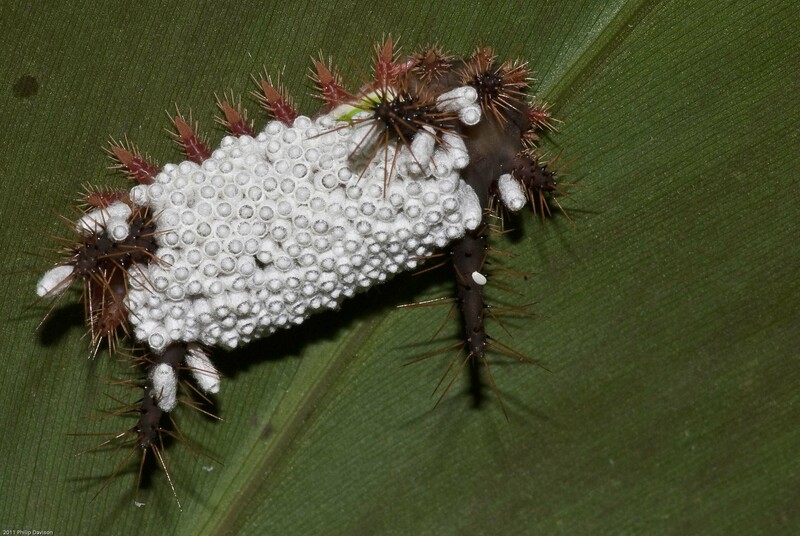 But even that heavy duty defense can be breached as has been the case with the example of an individual covered in the cocoons of a parasitoid wasp, the larvae of which had been consuming the now deceased caterpillars living flesh before pupating. 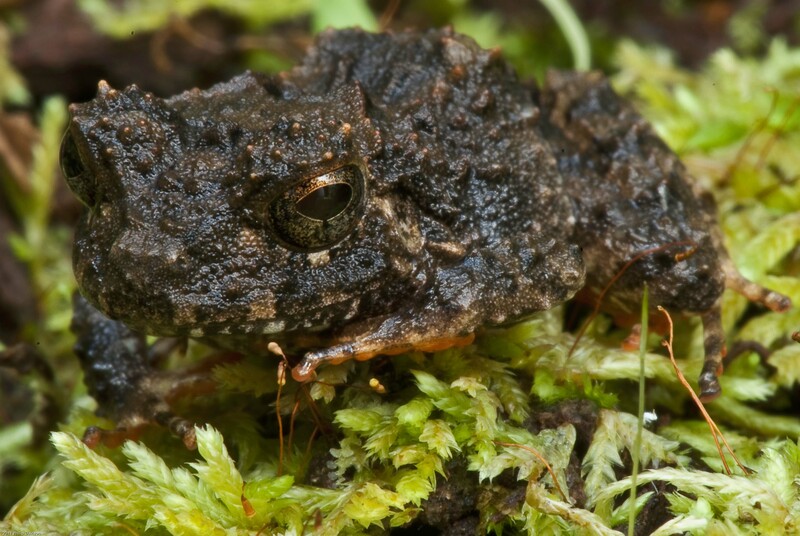 The forest floor was still damp enough for some of the rainfrogs to be found. 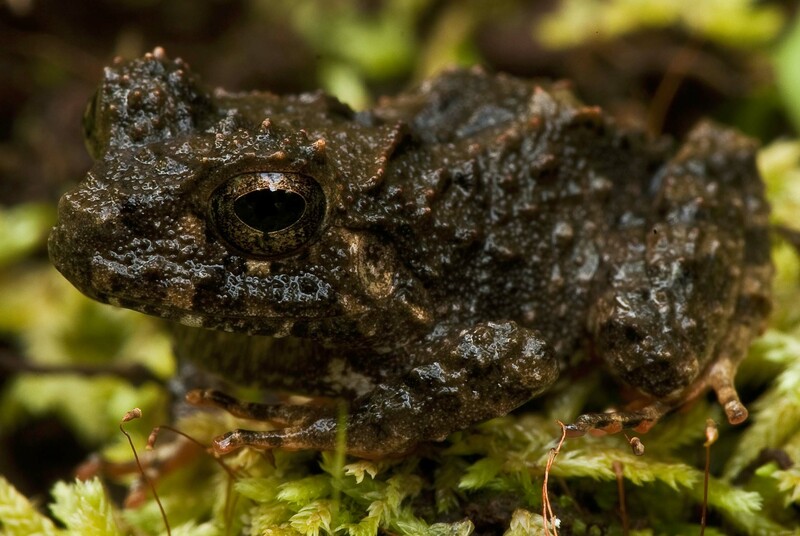 The rain frogs are generally colored in muted tones that blend into the background of the soil and leaf litter hues. 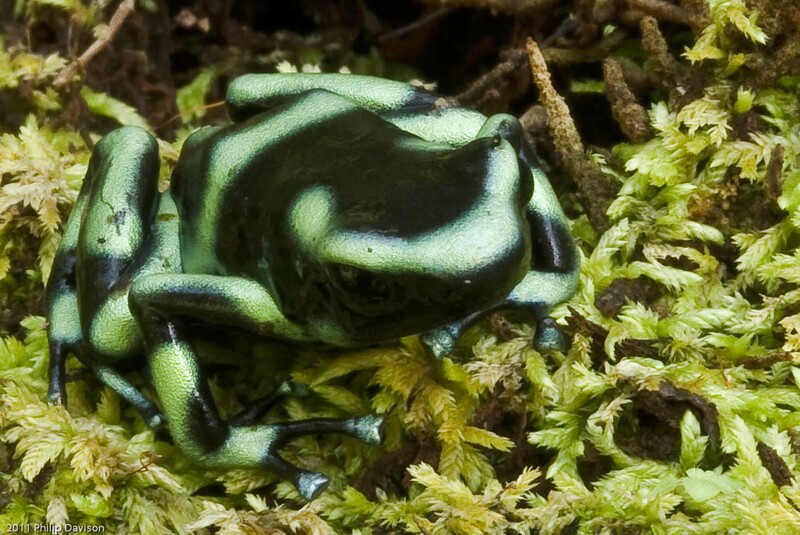 One frog commonly seen on the forest floor of Bosque is the Black and Green Poison Arrow Frog. Its bright neon green stripes contrast with the black markings rendering it as almost glowing against the dull backdrop of dead leaves. The very visible coloration is not there to invite potential predators to an easy meal but rather to warn them of the toxic and potentially deadly skin secretion exuded by the amphibian in times of distress. Frogs make superb photographic subjects if you take your time and move slowly in their vicinity. Snakes on the other hand require a great deal of patience and luck to photograph. In the spirit of self preservation snakes don’t want to be where you are, they will make every effort to go move in exactly the opposite direction from your lens. They move so fluidly and gracefully, not to mention rapidly for an animal with no legs. 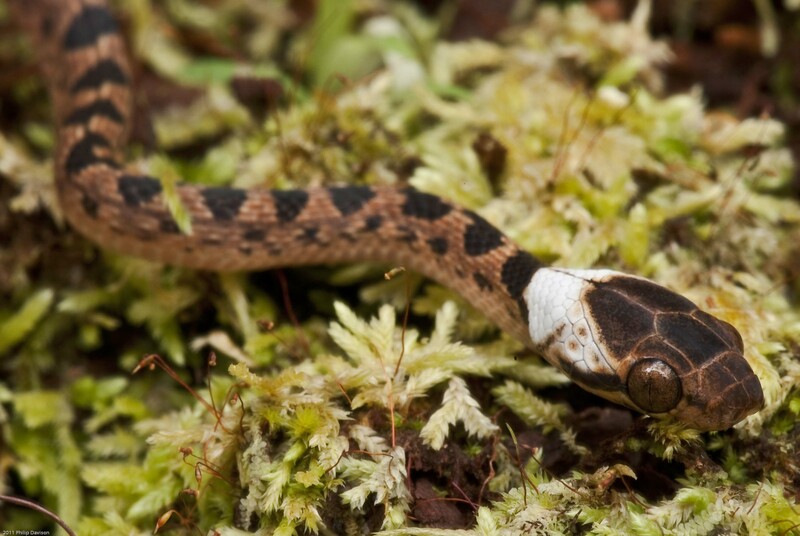 The young Northern Cat-eyed Snake, (Leptodeira septentrionalis) featured here eventually settled, snakes exhaust easily and it was only 8 inches long. 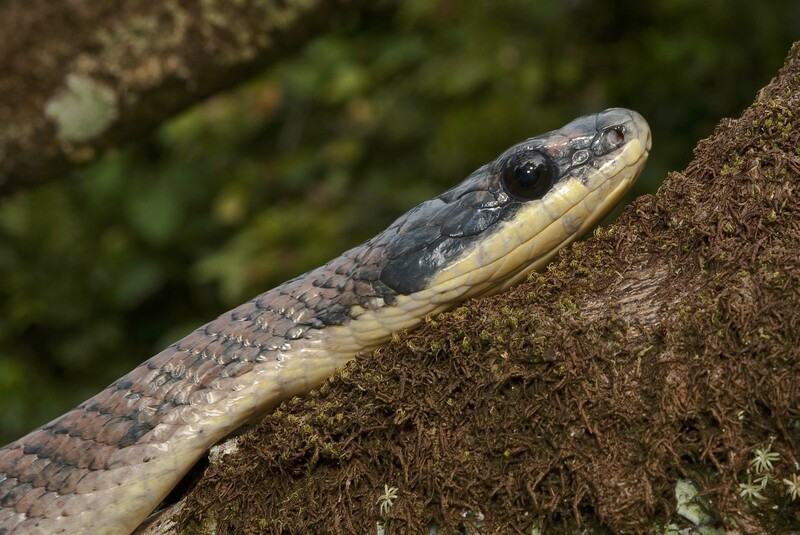 The Tropical Bird-eating Snake, (Pseustes poecilinotus), was a different proposition. They are fast and agile as well as irritably belligerent. Not everyone is comfortable handling snakes, particularly of an unfamiliar species, but knowing your subject helps with the chances of a good photo. Again my advice would be slow and fluid movements and get ready to move out of the way should the snake take offence to your close proximity. 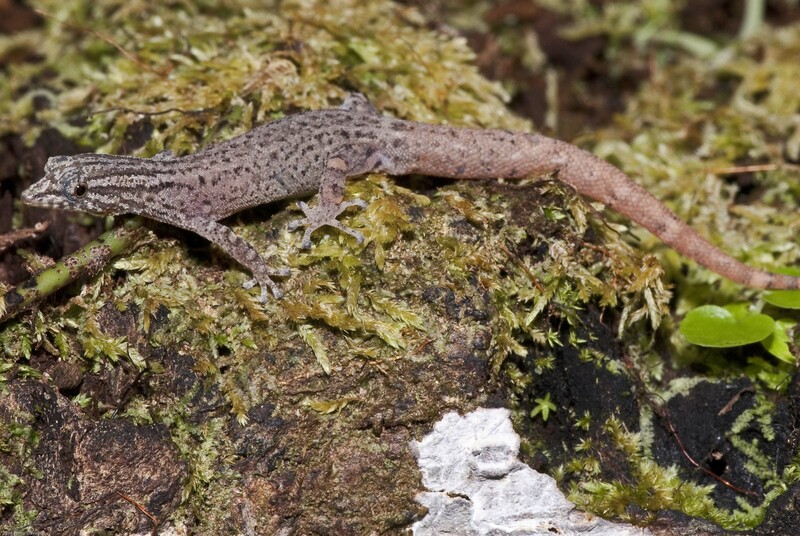 These little Clawless Geckoes abound in the buildings of Bosque but are so small that they are going to be overlooked by most people. This species is Sphaerodactylus graptolaemus, the name being longer than the creature. The spine over the eye is one of its distinguishing features. 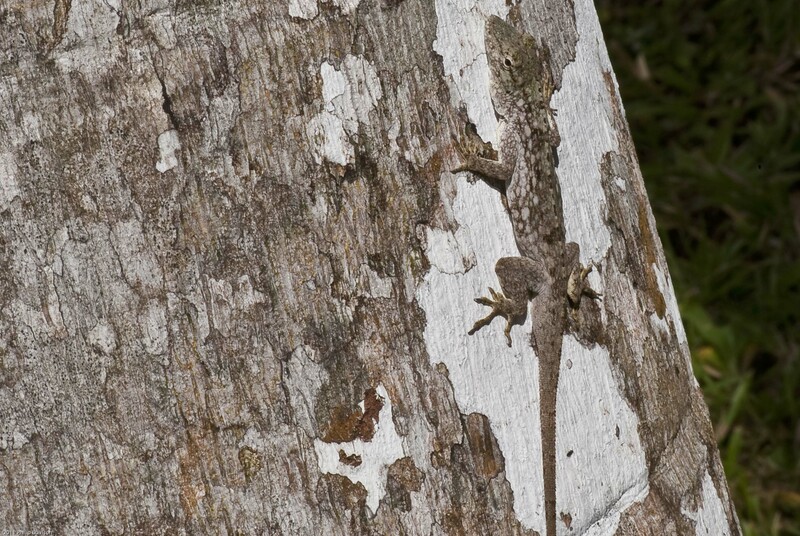 Whereas the Clawless Gecko is hard to find due to its size, the Lichen Anole, (Norops pentaprion), is not so easily spotted because it blends in so well with the color of the tree bark. 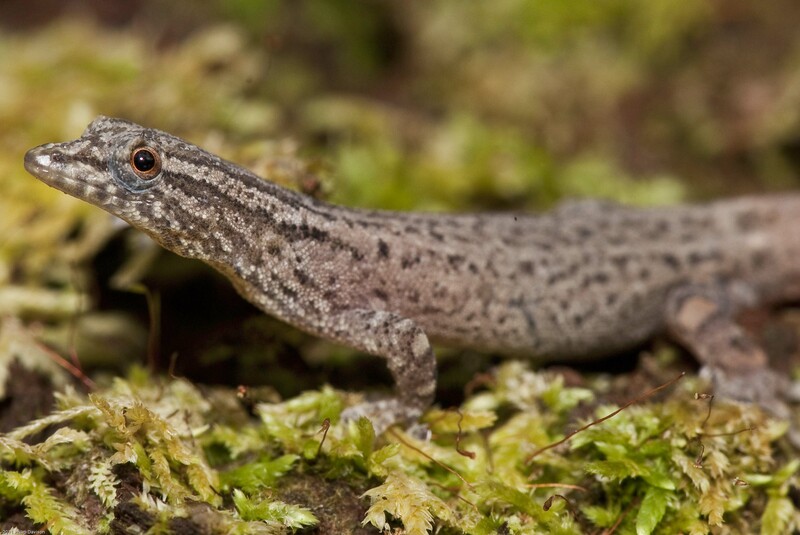 It is one of several different Anole species to be found on the grounds of Bosque. This is one of the larger, more solidly bodied anoles. It is less inclined to run and will stay put until the last minute before heading up and around the opposite side of the tree to yourself. When you go around to find it, more often than not, it will have miraculously disappeared. 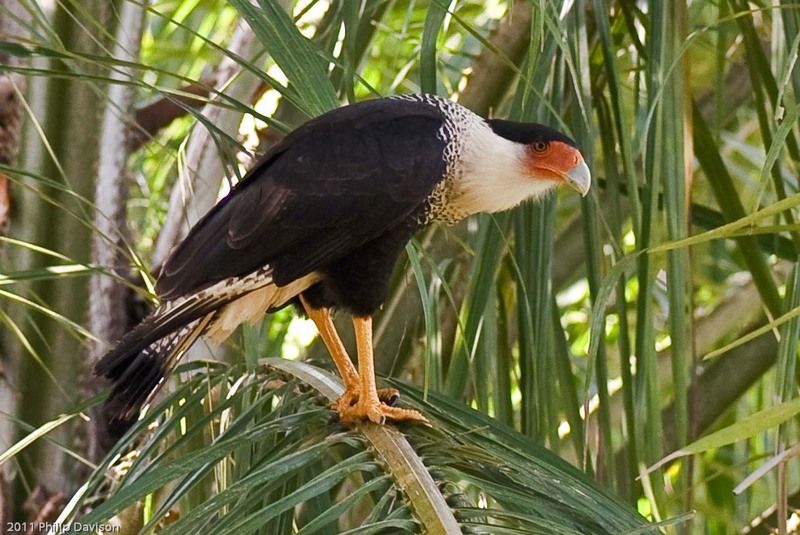 The grounds of Bosque are a bird lover’s delight. All manner of avian fauna can be found here. For those with a particular liking for raptors, there are Peregrine Falcons, Bat Falcons, Barred Forest Falcons, Laughing Falcons, Solitary Eagles, Ornate Hawk Eagles, Black and white Hawk Eagles, Roadside Hawks, White Hawks, Mangrove Black Hawks, Great Black Hawks, Broad-winged Hawks, Yellow-headed Caracaras, Crested Caracaras, Swallow-tailed Kites and Double-toothed Kites, just to name a few. I don’t normally have the camera set for bird or mammal photos and so these are the exception rather than the rule. Once again, Pumas have been the talking point of Bosque this year. In January, before the ground started drying, it was still possible to see pug marks in the damp earth. 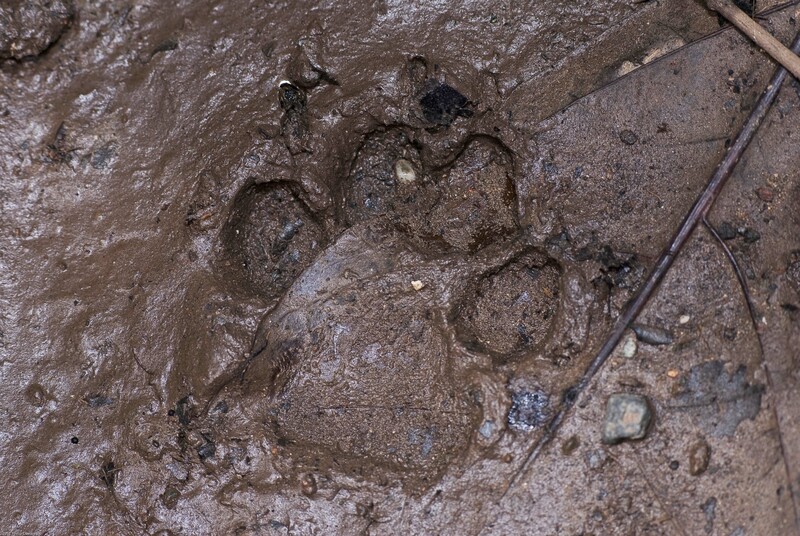 Never very far from the cat tracks you could find without too much endeavor, at least one or two individuals of the Pumas diet, in this case a Collared Peccary, (Tayassu tajacu). 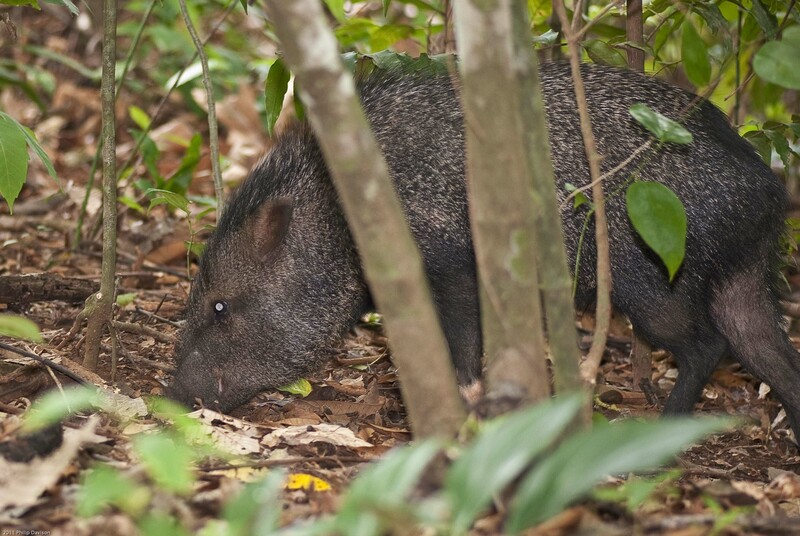 Collared Peccaries can sometimes be found in herds of up to 20 individuals on the Titi Trail. The reputation of their dangerous nature is saved for the larger White-lipped Peccary which is very rarely seen on the grounds of Bosque. The collared cousins do not pose a danger and will move off huffing and puffing if disturbed. Average M Temp High 86°F. Average Daily Temp Low 72°F. Average Daily Temp High 30.0°C. Average Daily Temp Low 22.3°C. At the beginning of this week the metrological office of Costa Rica promised that the rain we had not received so far in this wet season would in fact arrive with Friday being the designated day. They were not wrong. It had remained fairly bright and sunny up until dusk of Thursday, but everyone awoke Friday morning to a thunderous downpour. This cleared later in the day only to be repeated over the weekend in a similar fashion. I don’t know how far into the future the prognostication goes but at this moment the weather does seem to be taking a change to that which we would normally expect this time of year. While I was engaged taking photographs of a katydid, out the corner of my eye I saw something moving and then stop then move again. It repeated this action in a series of rapid motions. When I turned my attention away from the katydid, I found I was looking at an ant which was carrying something almost as large as itself in its mandibles. At this point it was almost in front of the lens so I could not resist the opportunity to capture its image. Ants are notoriously difficult to identify, which is a fairly typical situation with most tropical insects as I explain below with the beetles. One of the problems with the ants is not the sheer number of species, which doesn’t approach that of the beetles, but rather the fact that each species, particularly the highly organized social ants, have many castes within the nest carrying out different tasks, allowing the nest to function as a single unit. Many of the different castes are morphologically differentiated from one another, adapting them to sometimes very specialist roles. All of these different caste members, no matter how different they may look from one another, are nonetheless of the same species. I think this particular ant was one of the large ponerine ants whose species boast some of the large hunting ants. People are probably familiar with stories of the Bala or Bullet Ant. 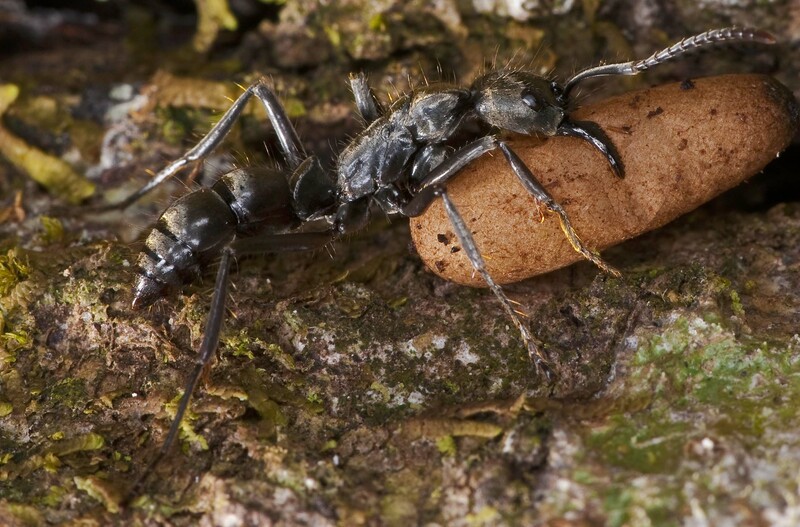 These are large ponerine ants whose bite can result in hospital treatment. The larger ones are found on the Caribbean coast of Costa Rica, but here on the Pacific we have some smaller versions which are equally as capable of packing a painful sting. It looked like this ant was carrying a cocoon, possibly containing an all but fully developed adult ant. It was being seriously molested by a small Solenopsis ant which appeared to be attacking it or trying to drive it out of the area, hence the rapid jerky movements. If you want to know how much of a sting a Solenopsis ant can pack, try standing in a Fire Ant nest. There are lots of species of beetle. Anyone who has previously read my blog will now know there are thousands, nay hundreds of thousands of beetle species around the world. 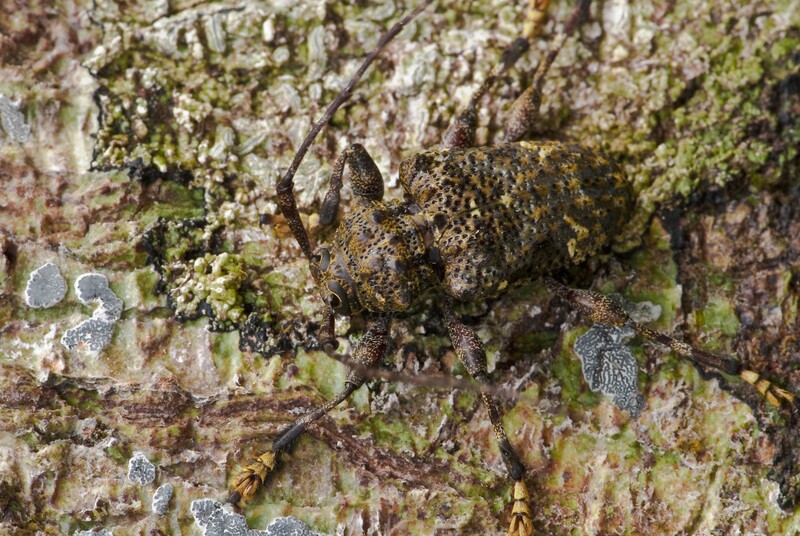 There are in the region of 320, 000 named species of beetle and that number is probably way short of the actual total due the many species of beetle that have not yet been found and named. 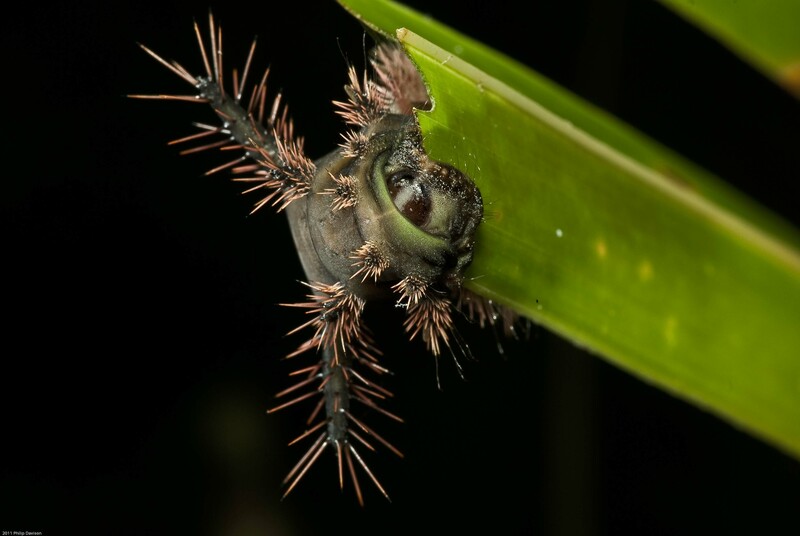 An estimated 1 in every 4 or 5 species of insect found during expeditions to the Amazonian rainforests will have previously been undiscovered and a great many of those will be beetles. Costa Rica has approximately 47,000 named species of beetle on its records and so when you find a beetle that you can easily identify, you are very fortunate. I know for some the challenge of identification is all part of the fun of field work, but when time is limited and you are dealing with a wide range of organisms, the easier the better. 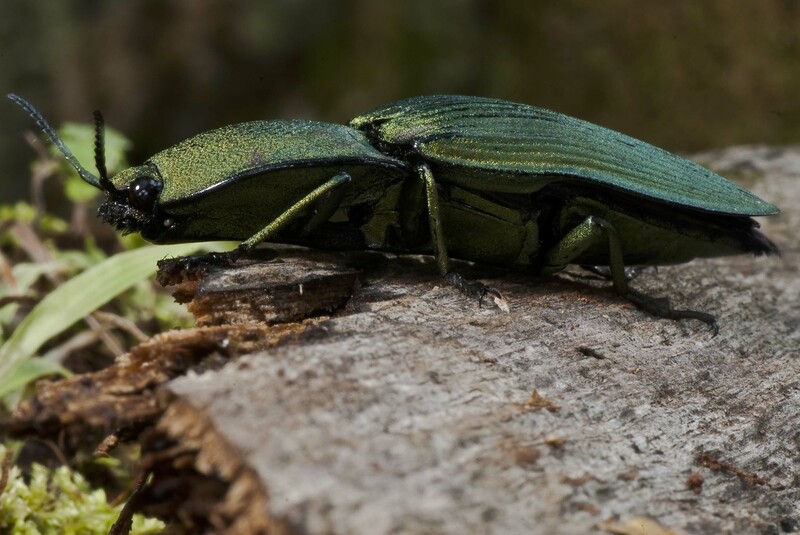 So when I found this beetle walking around on a rotting tree stump I was happy that I knew what it was immediately or at least what type of beetle if not species; a Green Click Beetle. 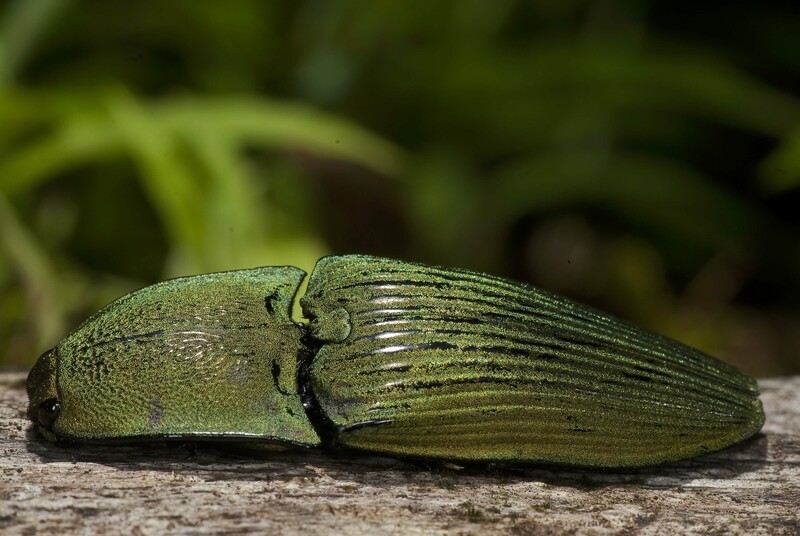 It belongs in the Family Elateridae, the Click Beetles of which there are approximately 1,200 species in Costa Rica. 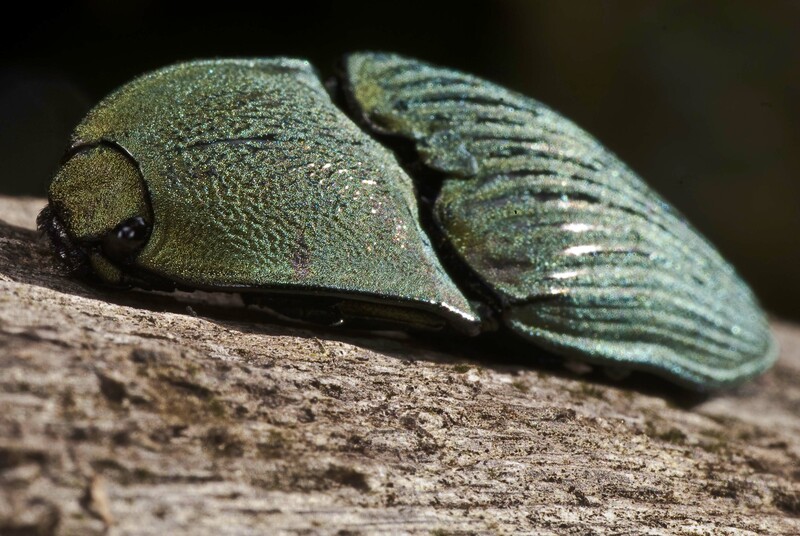 The name literally describes the beetle; it is a beautiful rich metallic verdant green. The click refers to the fact that in defense, the beetle will drop to the ground. If it should fall on its back or in an effort to escape a predator, the beetle has a modified mechanism on its back which under muscular action will allow itself to “click” or jump itself right side up or away from danger. As if to confirm my identification, the beetle obliged me by clicking and falling immediately to the ground. In order to photograph the beetle, I picked it up and put it back on its log but had it shut down, drawing in its legs and just lying still. As time progressed, and after I had fired off a few shots, it eventually became active once again, finally moving to the edge of the branch, opened it elytra, or wing cases and took to the air. Average Daily Temp High 90°F. Average Daily Temp Low 74°F. Average Daily Temp High 31.7°C. Average Daily Temp Low 22.9°C. After the erratic start to the rainy season, things have now more or less settled into the usual pattern for this time of year. The days are bright and sunny but every night, generally earlier in the evening, the rain comes down. Most visitors to the lodge are relatively happy with this scenario as it allows them to get out and enjoy activities during the day and they are normally in bed while it rains. If it does rain during the day, I always suggest it is a good idea not to don rain jackets. You will get just as wet as without them because of your profuse sweating. Skin is the most waterproof thing you have and once that gets wet, you are not going to get any wetter and the one thing that you are not going to die of here is hypothermia. The wet conditions caused a sudden flush of fungal fruiting bodies. 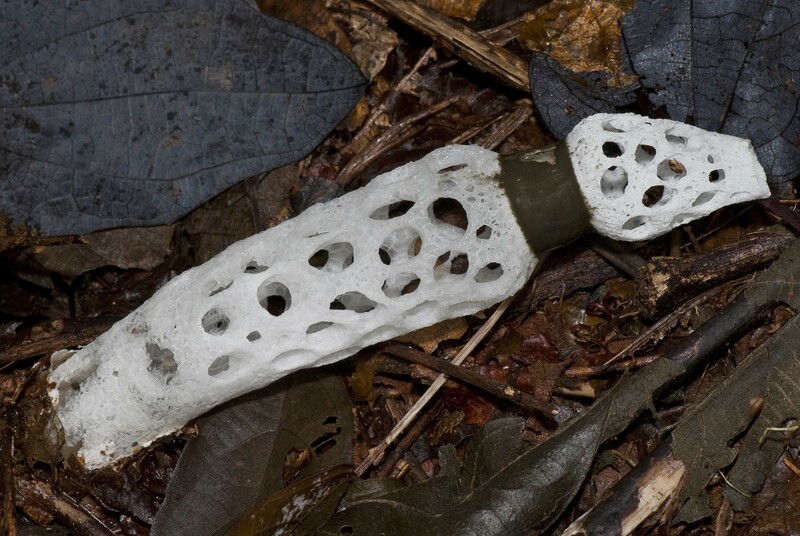 In the lawns around the restaurant over a period of several days, we observed the appearance of Swiss Cheese Stinkhorns, their long phallic shapes having the holes which give them their name. The tip is covered in a gray gelatinous spore carrying mass that stinks of carrion. 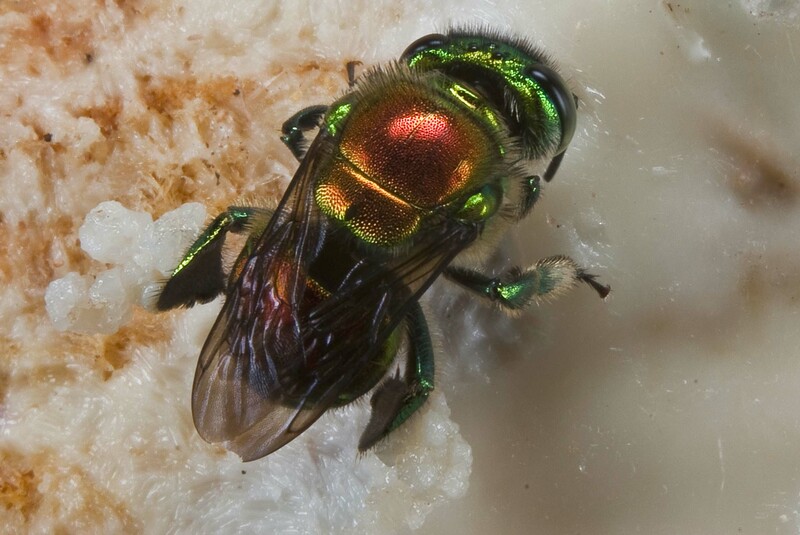 The smell attracts flies that land and finding no food, fly off, but by that time they have become coated in spores, and consequently act as unwitting disperses for the fungus. 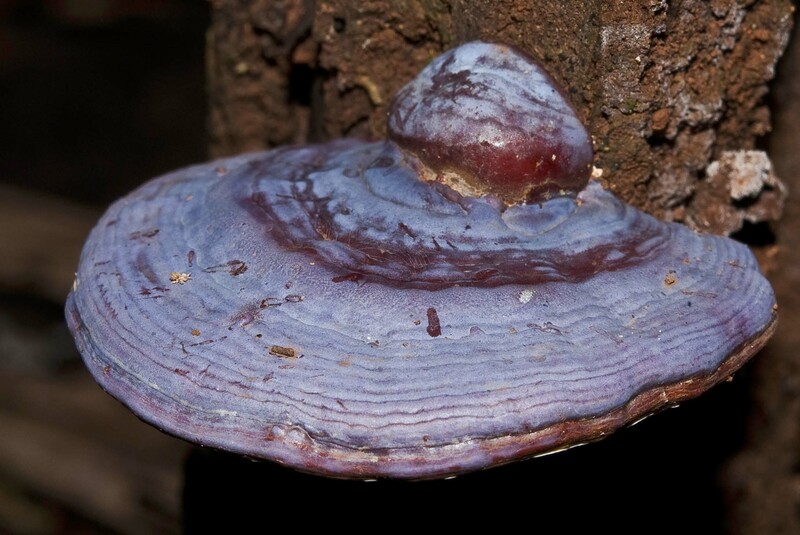 In the forest, bracket fungi proliferate, their woody fruiting bodies appearing as multi-colored saucer shaped shelves from the side of the trees. 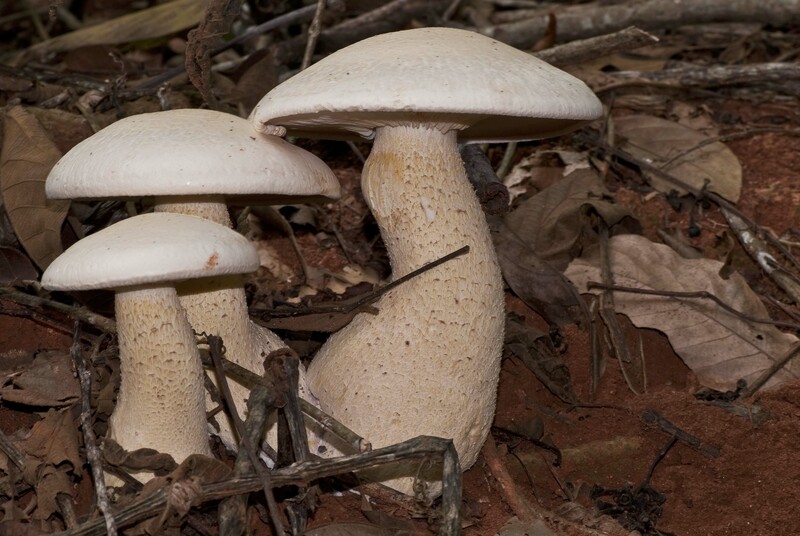 There are the more familiar mushroom like forms ranging in size from tiny to huge. Fungi for the most part are saprophytes feeding on dead or decaying material. Some are club or finger-shaped, looking nothing remotely like the mushrooms people are familiar with. 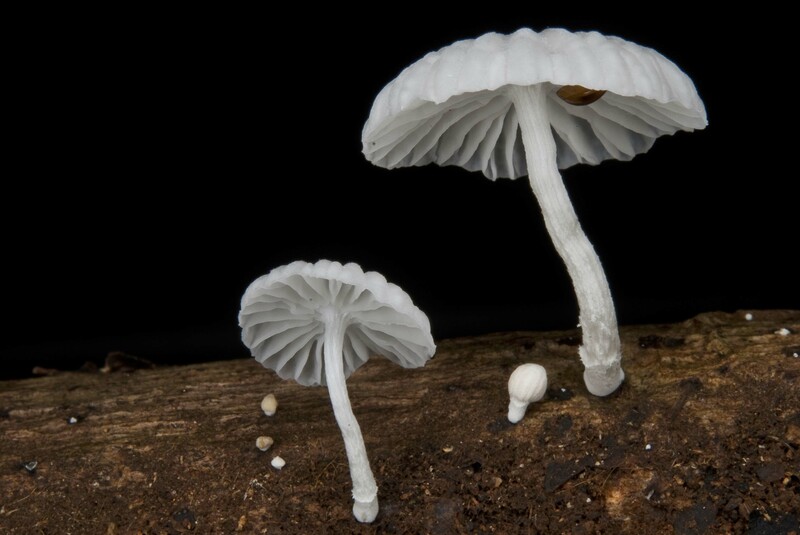 As with everything else, the fungi diversity is very high, but with no real adequate reference to identify them, it is sometimes only possible to classify them as far as family level. They still provide an interesting sighting on the trails though. There was one incident last week that thankfully had a happy ending. Some guests were waiting to leave after breakfast, everyone had said their goodbyes, but as they awaited their taxi, something crashed to the ground behind the kitchens. Heavy rain the night before had destabilized a Paper Wasp nest, huge in dimensions, which had been constructed over many years at the top of a Mayo Tree. This particular morning, the bottom half fell away, carrying a great number of wasps with it. There is nothing worse than having their house fall apart to raise the ire of these stinging antagonists. They proceeded to launch a savage assault on anyone or anything in the vicinity, mattering little to the wasps that the objects of their wrath were innocent of any crime against them. In situations like this, your best option is to run, fast and far. Do not head for the swimming pool, which is where the staff and guests unfortunately made a beeline for. Upon surfacing for air, the yellow banded assassins will simply continue their attacks; you are a sitting, or swimming target. Fortunately no serious damage was done and the guests left, damp, laughing and with a tale to tell. The initial blame was laid at the door of “Africanised Bees”, but when I returned and looked up at the remains of the nest I could see it was in fact the Paper Wasps that had been responsible. About a week later, one night and without further disturbance to anyone, the remaining inhabitants of the broken shell just disappeared. The huge Milky Tree that fell last week, continued to exude copious amounts of sap for days on end. 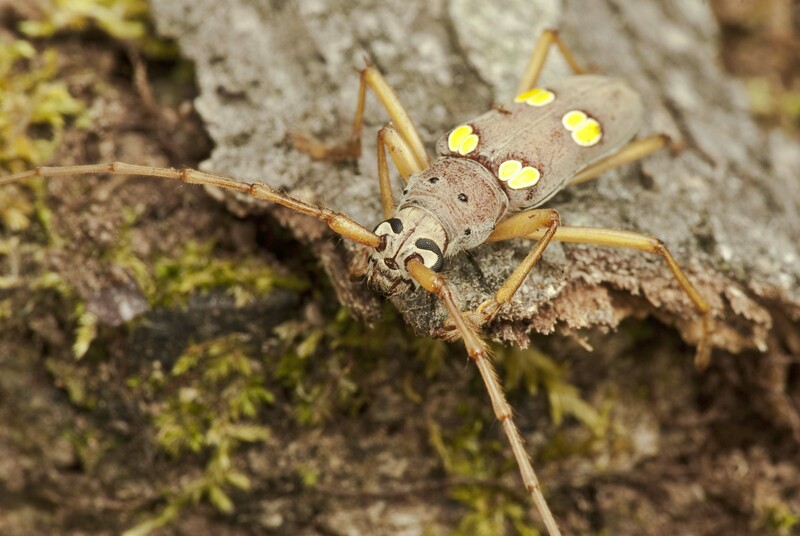 This has provided a huge amount of interest for many of the forest insects. As you approach the tree, which was cut into sections to clear the trail, the hum of insects involved in a sap collecting frenzy can be heard. It doesn’t take a great deal of close scrutiny to evaluate what is going on. 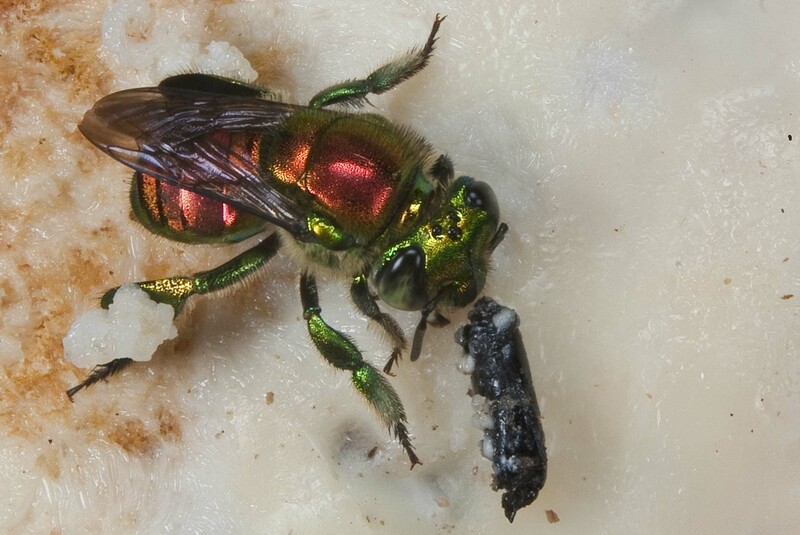 Bees, of many different species belonging to a whole variety of genera from many different families, can be seen, busily collecting the exudates. It is the females, their rear legs, normally used for pollen collection but now heavy with the procurement of resins that they will use to manufacture combs or construct nests. It is a risky business though, landing on a sheet of soft white sticky glue which is leaking from the tree. The area looked not unlike a miniature modern day version of the La Brea tar pits that ensnared many an unfortunate prehistoric mammal. Bees of all sizes that had landed before the resin had set were simply stuck and covered by more of the viscous latex. 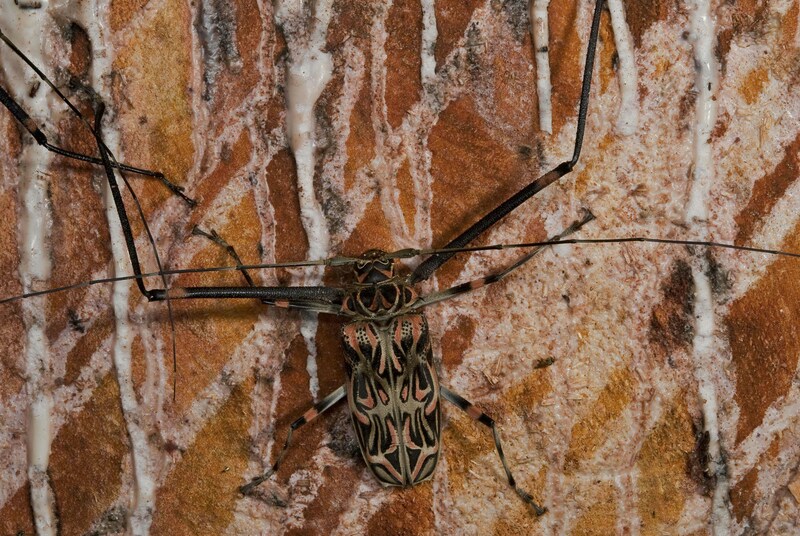 One other insect, rarely seen, until a Milky Tree falls and then they appear as if by magic in large numbers, are the Harlequin Beetles, (Acrocinus longimanus). Named after the red and black costume of that devils advisory, Harlequin, you would think the beetles, given their large size and color would stand out against the tree trunks. Exactly the opposite is true; the cryptic coloration blends in perfectly with the background color of lichens covering the bark of the trees. Unlike their namesake, they are far from nimble, the long legs, (latin: longimanus), causing them to scramble and climb in an ungainly lumbering manner, not unlike a grounded bat. 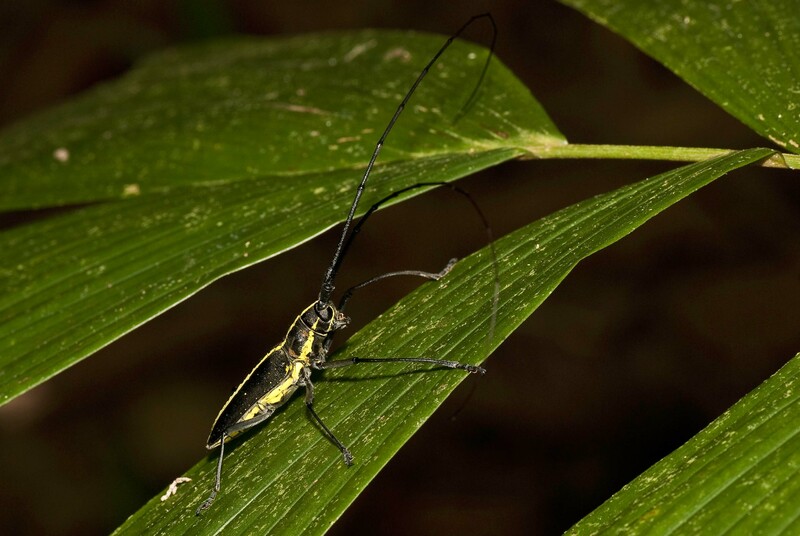 Harlequin Beetles are Longhorn Beetles, (Family: Cerambycidae), named as such because of their very long antennae. They appeared to be feeding on the plant sap and because there were males and females, it could well be that they were there to mate, their larvae boring into and feeding on dead wood. 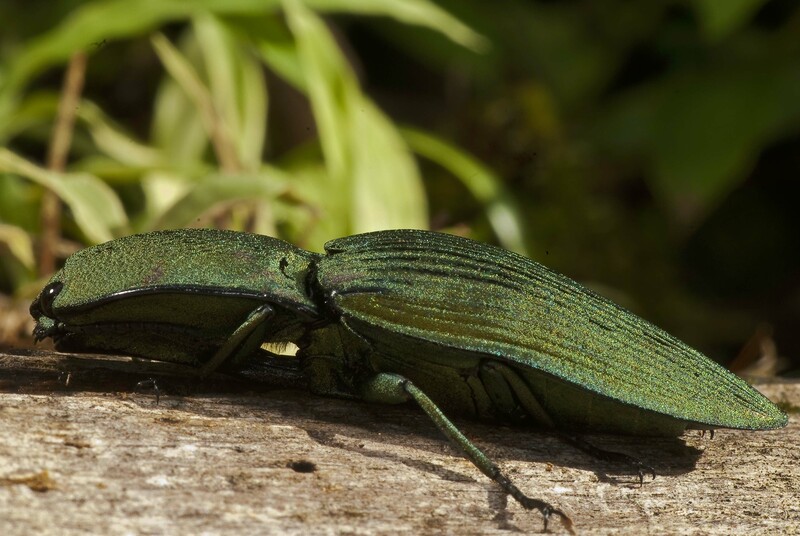 If you touch one of the beetles, they make a loud hissing sound, raise their elytra and take to the air. Such a large heavy beetle, only flies clumsily short distances before landing again, but hopefully out of harms way. Over a 24 hour period, the bees had succeeded in removing all of the resin which for several days had been leaking from the tree in gallons. Average Daily Temp High 86°F. Average Daily Temp Low 73°F. Average Daily Temp High 29.6°C. Average Daily Temp Low 23.8°C. Now the dry season is really beginning to manifest itself. The lawns are starting to look brown and burnt. The vegetation is looking tired with wilting leaves being shed along with the branches bearing them. Temperatures are consistently in the 100’s Fahrenheit. There have been one or two little sprinkles of rain but never amounting to more than enough precipitation to only slightly dampen the ground, only to evaporate as quickly as it arrived. Last week saw a full moon and a one that was hyped as a super full moon. The moon was to have been at its closest point to the earth and coinciding with a full moon was spookily suggestive of going to cause all manner of catastrophe. Don’t tell anyone but the moon is that close every month, it is just that this is the first time in 18 years that the event coincided with its position being on opposite sides of Earth to the Sun which was illuminating it full face. It was also the Vernal Equinox, with the sun being directly over the Equator on March 21st ensuring 12 hours of both day and night. Progressively as we move into the northern summer the prevailing climatic conditions here at Bosque change with the South Westerly Trade Winds bringing moisture laden air from the Pacific Ocean and precipitating it as rain on the west coast of Costa Rica. Paradoxically the northern summer equates with the wet season, which here is known as the invierno or winter. One other point of interest is that the full moon occurring just before the Equinox results in a very late Easter this year. I am not sure as to the significance of the calculation but Easter is the first Sunday following the first full moon after the Vernal Equinox. Puma sightings continue to dominate the mammalian excitement around the lodge. Last week there was a young couple who had only just arrived, checked in and shown to their cabin in the tropical garden. Within very few minutes of starting to unpack their luggage, two Pumas walked past the cabin and into the exit of the Zapatero Trail. They were lucky enough to have their camera at hand and managed to take some good photos. Later on the same day, I had just finished my prepatory talk and demonstration with a small group of visitors wishing to do the zipline. I was just attaching myself to the line in order to zip across the valley when one of the participants said, “There is a Puma”. Sure enough it was the half tailed female Puma with whom we have become familiar from various trails around the grounds. She walked straight toward us to the point where I thought she was just going to traverse the platform we were standing on. She stopped at the base of the tree 15 feet in front of us, standing on the buttressed root; she looked at us for about 20 seconds and the continued on her way totally nonplussed by the experience of six blue helmeted pink monkeys standing looking at her. At the moment we have the annual flowering of the Guapinol, (Hymenaea courbaril), or Stinky Toe Tree. The resin from this tree is the source of Central American amber. 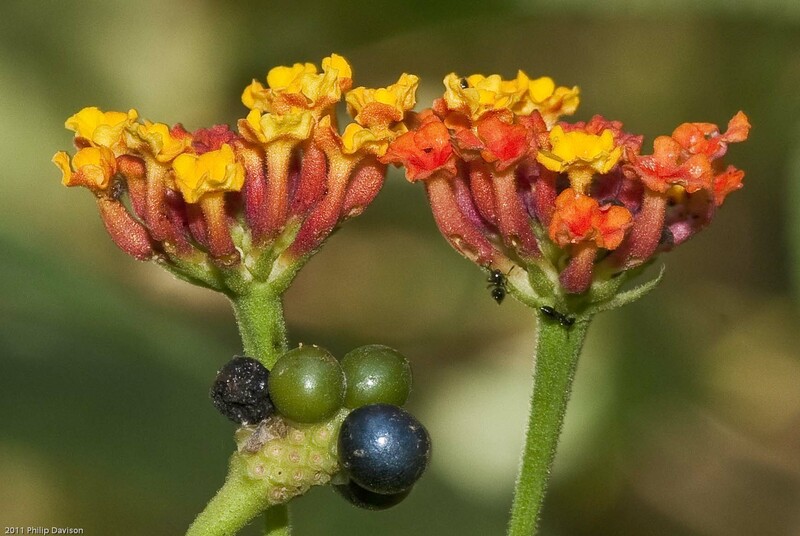 The fruits are hard shelled beans containing seeds surrounded by a soft pulp, which to all intents and purposes has the odor of smelly feet, hence the name. 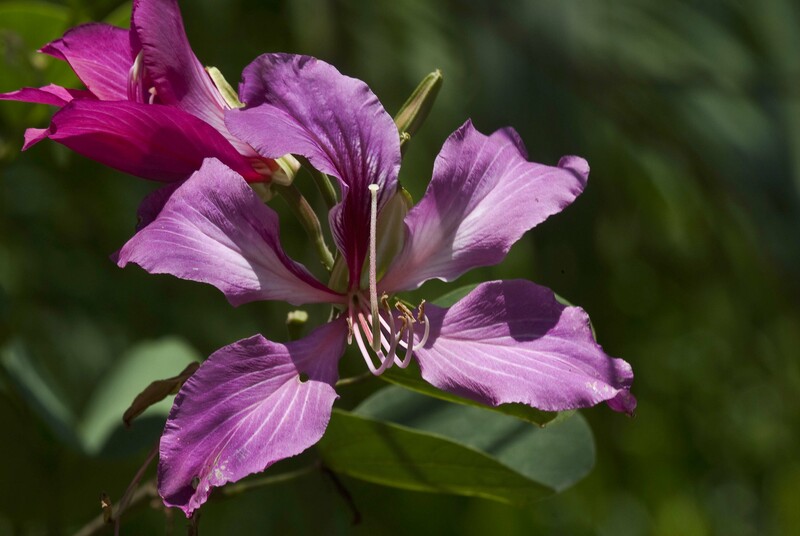 While it is flowering, at night it provides the spectacular sight of the Jamaican Fruit-eating Bats which wheel and dive in hundreds, landing briefly to imbibe a feed of nectar. Reproduction has been the real essence of the week and across the board. One night down the pond I came across a Virginia Opossum with two well grown babies hanging onto her back. Most of the monkey troupes currently feature females with young ones of various ages in similar attendance. One day last week, as I walked down the road that runs through the Teak Plantation, one of our gardeners was frantically waving his hands at me from further down the path. I couldn’t see what it was that was causing the animated excitement. When I got to where he was, he told me that not 5 minutes earlier two very young Puma cubs had been playing together in the road. The mother had been sitting off to one side watching him watching them. What a shame I was not just a fraction earlier or quicker in my step, as I did have my camera in hand. But that is life, who knows over the years how many events I was fractionally too early or two late to have experienced. There are lots of bird nests around the grounds now. Near the swimming pool there is a Cherrie’s Tanager nest. In the top garden I noticed a male Masked Tityra constantly visiting a hole in a rotten Cercropia tree, probably delivering food to a female who may be sitting on eggs. Two Great Kiskadees have a nest near the Bosque garage which they visit continually bearing insect food items. Similarly within the forest I have also seen nesting Black-throated Trogons and Wedgebilled Woodcreepers as well as female Currasows with chicks in tow. 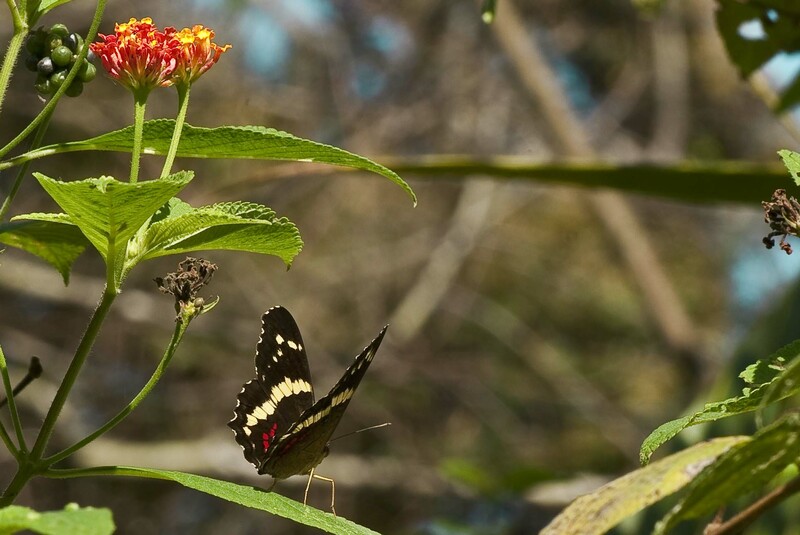 Over the past few weeks there has been little change in the number of butterflies but a big change in the species of butterflies making up those numbers. Over a month ago we had huge numbers of the White-banded Peacock, (Anartia fatima), emerge, and they are still around in sizable numbers. This was followed a few weeks later by a huge increase in the numbers of Carolina Satyrs, (Hermeuptychia hermes), a tiny little brown butterfly, again always here in decent numbers but as of late, substantially increased. 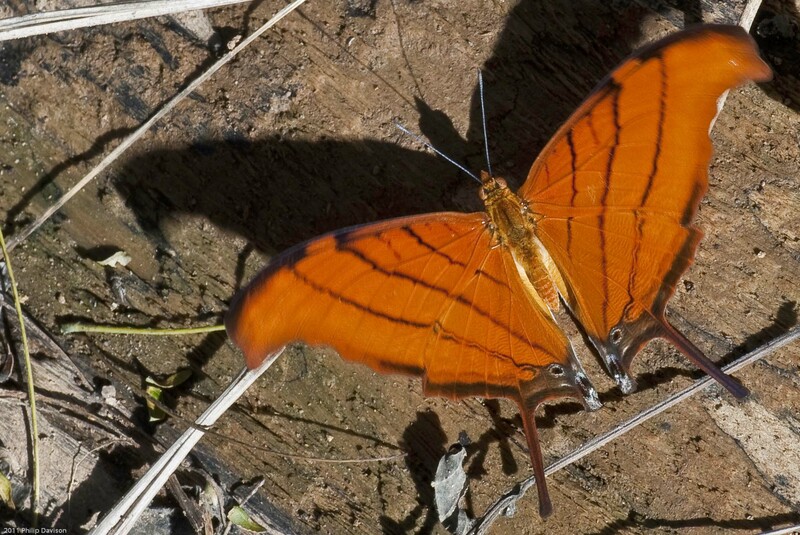 Now it is the turn of the Sharp-winged Longwing, (Eueides lybia). These tend to be absent for large parts of the year, but explode in numbers during February and March. 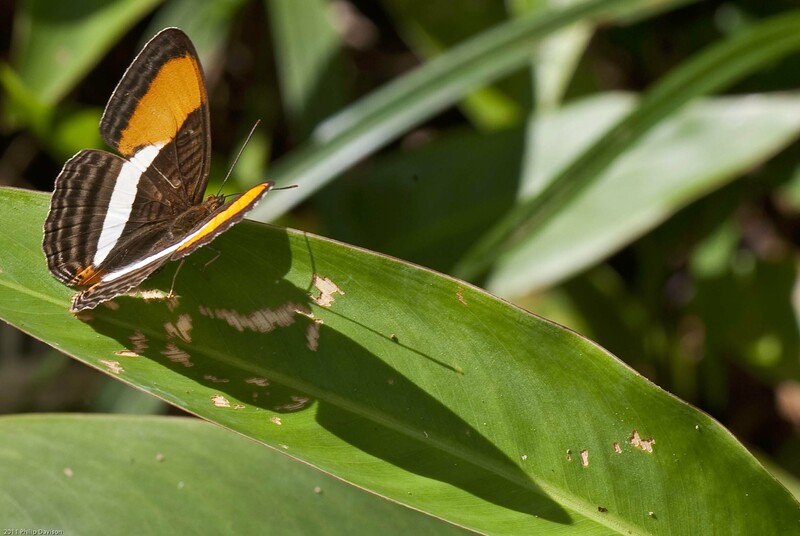 They are primarily an understory butterfly, so as you walk through the Titi Trail or Zapatero Trail, you will be treated to the sight of swirling masses of these medium sized orange and black butterflies. The daily hot, dry weather ensures that the butterfly figures remain high. Just a brief walk around the perimeter of the Tropical Garden will reward the visitor with phenomenal numbers of butterflies from a myriad of species. 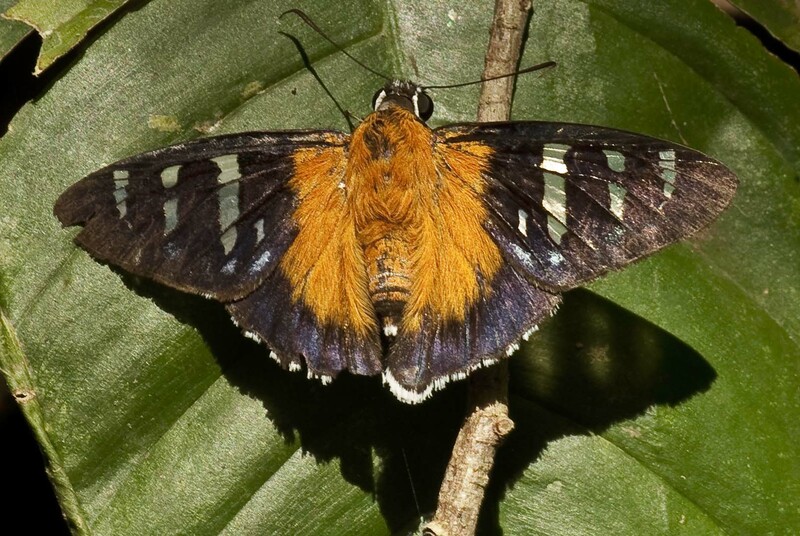 This week’s butterfly count resulted in yet another new species record for the lodge, Yanguna cosyra, a pretty orange skipper evocatively known as the Burning Firetip. The two damp nights encouraged the Halloween Crabs to abandon their holes in the ground and emerge to forage enmasse. Halloween Crabs are detritus feeding land crabs, about 2 inches across, with a bright purple shell bearing two orange spots which gives them the appearance of a Halloween mask. One night when I walked into the bar, a gentleman staying at the lodge asked me if I could identify a beetle he had kept to show me. The previous night as he lay in bed he could feel something crawling on his skin so he got up and went to look in the mirror to see what it was. On his cheek was a large black beetle which he put into a bag in order to identify and photograph. Sometimes people fail to understand the numbers that exist in terms of biodiversity in the tropics. 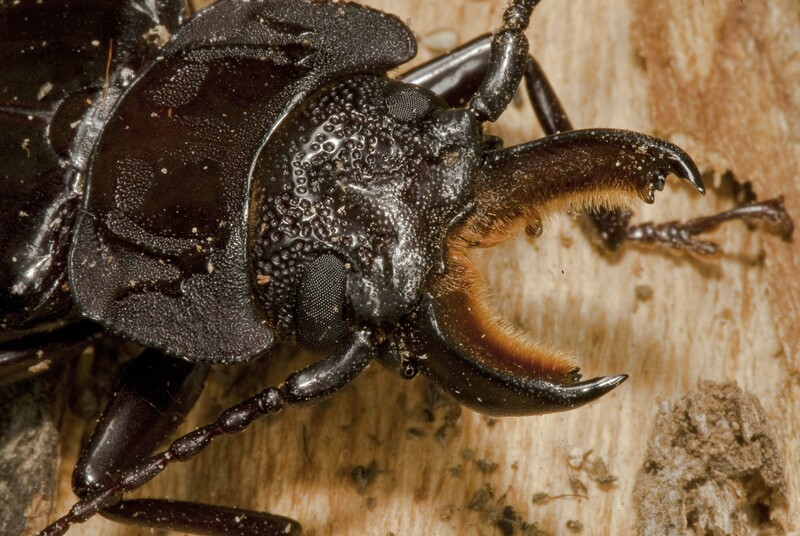 Those numbers can be exemplified by looking just at beetles. Beetles are the most numerously named group of animals on the planet. We have named in the region of 320,000 species of beetle. 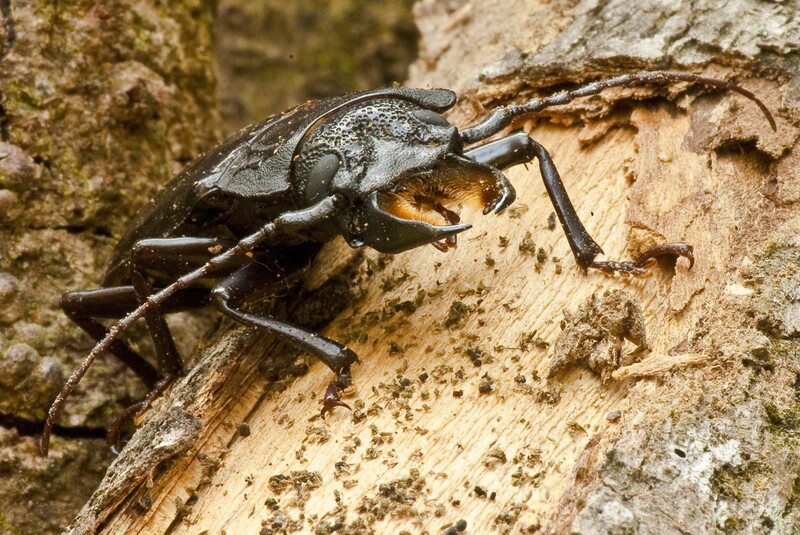 Costa Rica has 47,000 species of beetle give or take one or two. It is estimated that 70% of all insect species are beetles and that 40% of all animal species are beetles. Despite their numbers and the myriad forms and colors in which they appear, most people could recognize a beetle, the problem is which beetle. Perusing all of my reference literature followed by extensive internet searching, I could find no match for this particular species. I would have, in fact, amazed myself if I could have put a species name to it, and even then I would have done so with some hesitation. 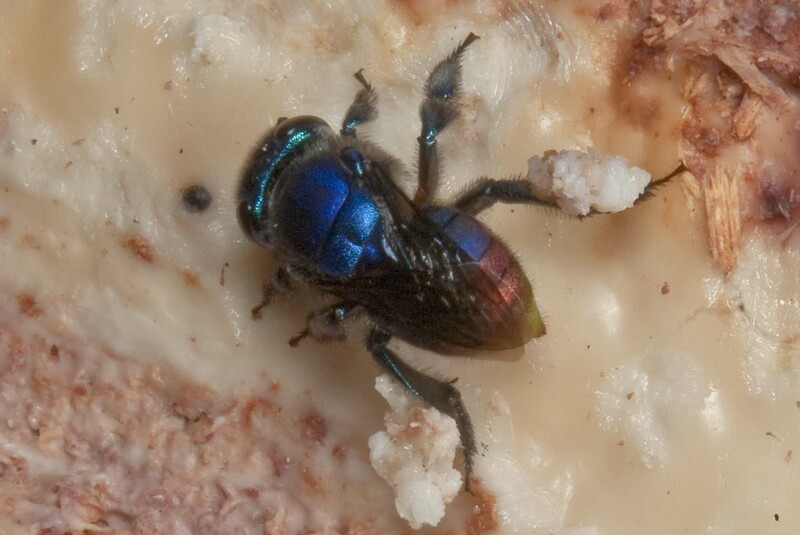 All I am left with is an unknown beetle; I cannot even put it into a family, so I feel a trip to the National History Museum in San Jose may well prove prudent in an effort to elucidate this individual’s identity. 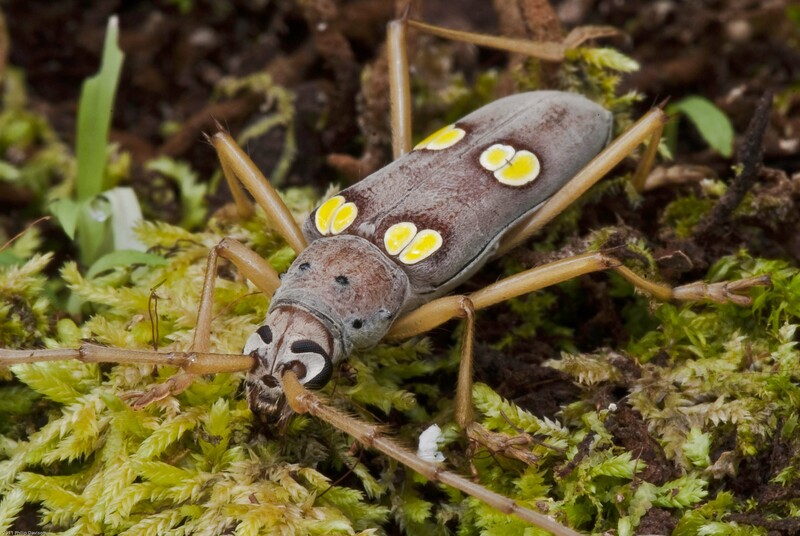 Once I have that I might be able to find information as to its life history and the story behind those fearsome mandibles and why they are lined with those orange brush-like structures, unless, of course there is someone out there reading this who can provide that information for me. Average Daily Temp High 94°F. Average Daily Temp Low 73°F. Average Daily Temp High 34.4 °C. Average Daily Temp Low 22.7 °C. The dry season is now well and truly upon us. The daily temperatures are now reaching into the nineties and the rain has all but stopped. The skies are cloudless and azure blue giving you the feeling of a typically tropical day. The rising temperatures and drying air have resulted in a profusion of color. Many of the trees are in bloom and even if you can’t see the flowers because of their lofty position at the top of the canopy, you can certainly see them when they fall. Areas of the forest floor are now carpeted with the spent blooms of the trees, around the trunks of which they form brightly colored circles which contrast with the dark browns of the rapidly decomposing leaves and the deep reds of the iron rich soils. 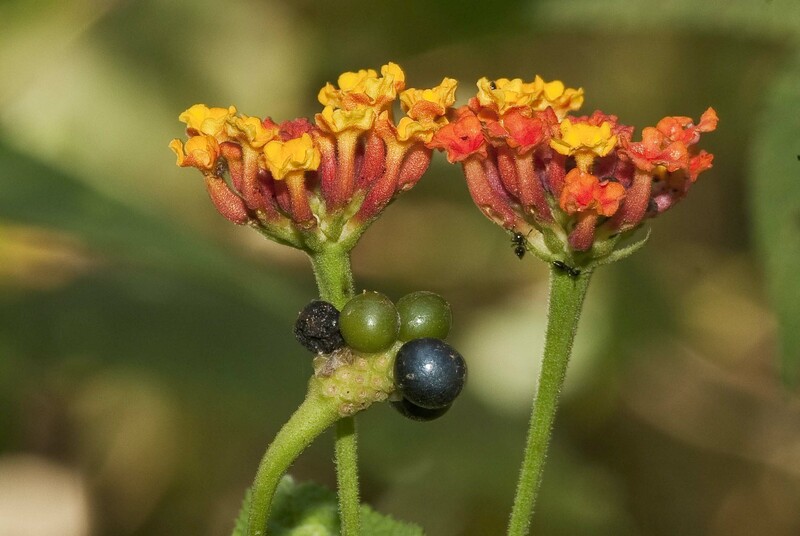 The Golden Cortez has flowered for the second time since the rains have diminished. The Ajo or Garlic Trees are flowering throughout the forest and their discarded bright lemon yellow flowers break up the monotony of the forest floor. They emit the faint odor of garlic, from which they derive their name, evoking thoughts of French and Italian cuisine as you walk the forest trails. Fruits of the Heisteria Trees dot the ground here and there. Commonly known as “Dinner on a Plate”, the bright green fruit sits at the centre of a circular scarlet fleshy veil. The red color attracts small fruit-eating birds such as manakins whose attention is rewarded with a juicy fruity nutritious pulp, the consumption of which results in the transport and distribution of the plants seeds. Many of the plants have weird and wonderful looking flowers and fruits, two of which are in evidence everywhere at the moment; the spiny sea urchin like fruits of the Monkey comb Tree and the small doubled layered ear-like flowers of the Hule, or Rubber Tree. 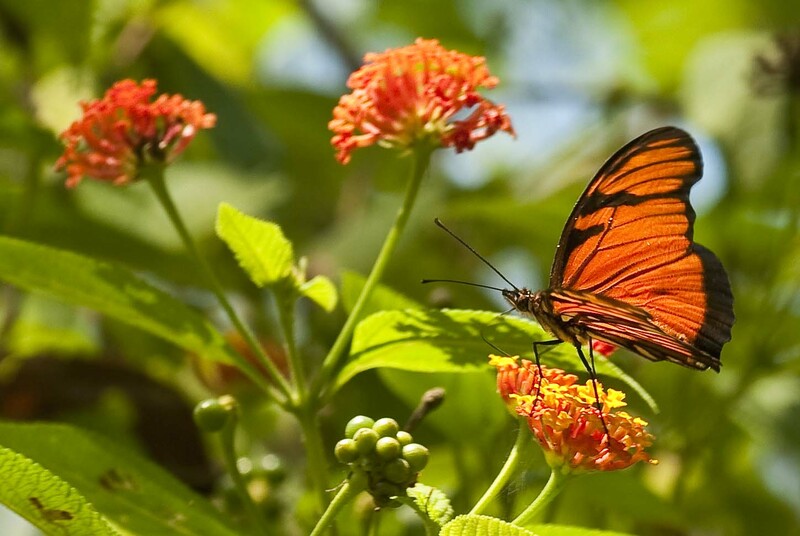 Butterflies, like a kaleidoscope of color against the bright blue sky are everywhere now. Out in the open areas the gaudy warning colors of many Heliconiids, or Passionflower Butterflies, are swirling around the flame orange and red flowers of the Lantanas. A host of Satyrs, with their more subtle but nonetheless, captivating colors can be seen flitting in abundance just above the level of the forest floor. The impressively giant and highly iridescent Blue Morphos fly along the forest trails and drying stream beds, erratic flight paths with opening and closing wings give the stroboscopic effect of flashing electric blue lights. 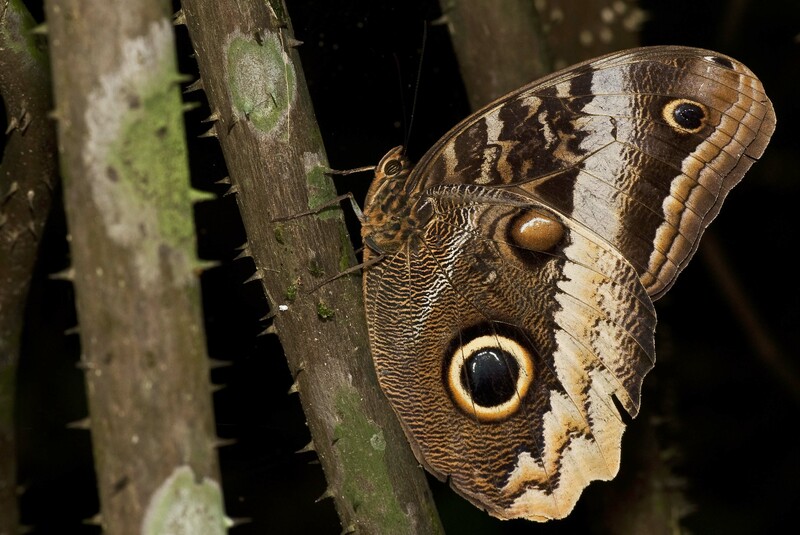 Their equally imposing cousins, the large Owl Butterflies fly in late afternoon. They look like large bats floppily haunting the forest edge in the dying light. 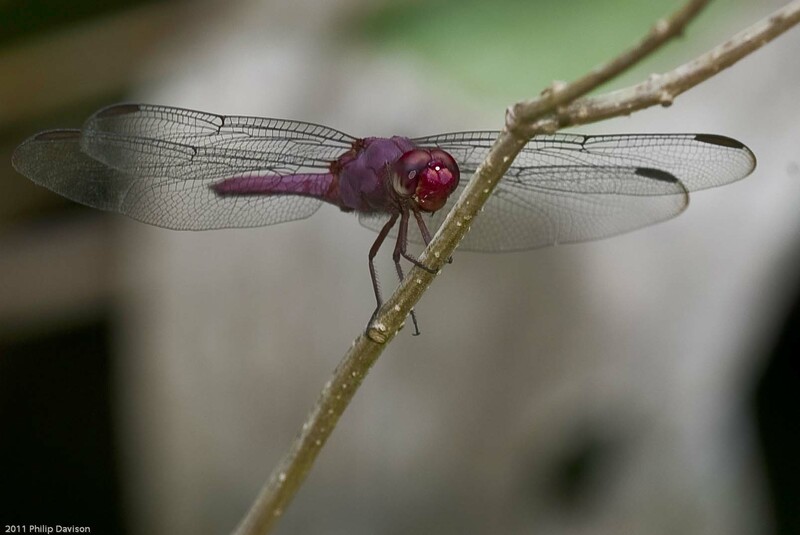 Around pools, streams and ponds there are now a multitude of Dragonflies and Damselflies. Aerial acrobats and proficient hunters briefly perching on the vegetation, then off at high speed to pursue some unsuspecting insect prey or chase rival males, their presence is announced by a variety of colors. The large Helicopter Damselflies, stealthy hunters of spiders, never fail to amaze anyone witnessing their distinct seemingly rotational wing beats. 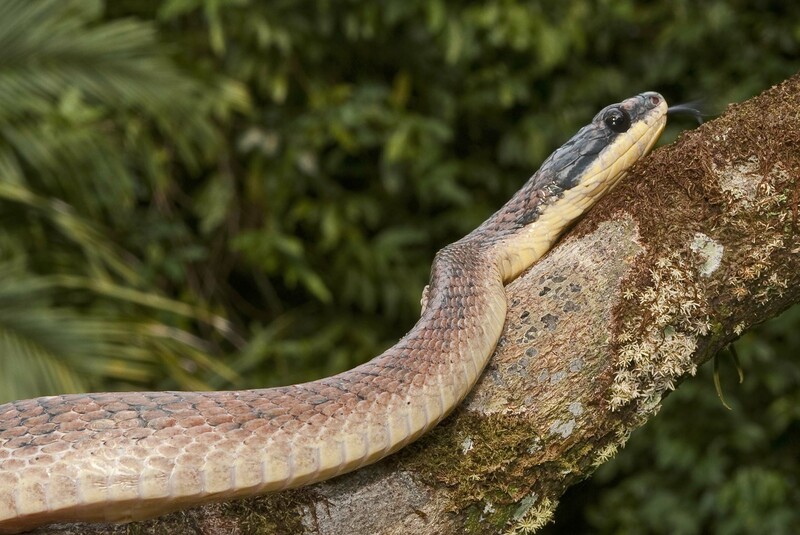 Last week I saw a large Tiger Rat Snake which had been basking on the trail from the Tropical Garden. The snake saw me at the same time as I saw it, but was a lot quicker than myself and disappeared very quickly into the undergrowth. Not long afterwards I could hear the Hee Haw sound of a Laughing Falcon which seems as if it will continue forever. They are specialist snake feeders and so it could well have been to Tiger Rat Snake’s advantage that it was me disturbing it, rather than be caught up in a terminal grasp of its aerial predator. Now that some of the trees are coming into fruit, the small rogue company of Capuchin Monkeys that were eating the toucans and stealing food from the bordegas have made themselves scarce. I have seen them moving through the forest, although I would not swear it is one and the same troupe. But having been a daily feature, they are somewhat noticeable by their absence. There are in the region of 320,000 species of named beetle around the world, making beetles the most numerously named group of animals on the planet. 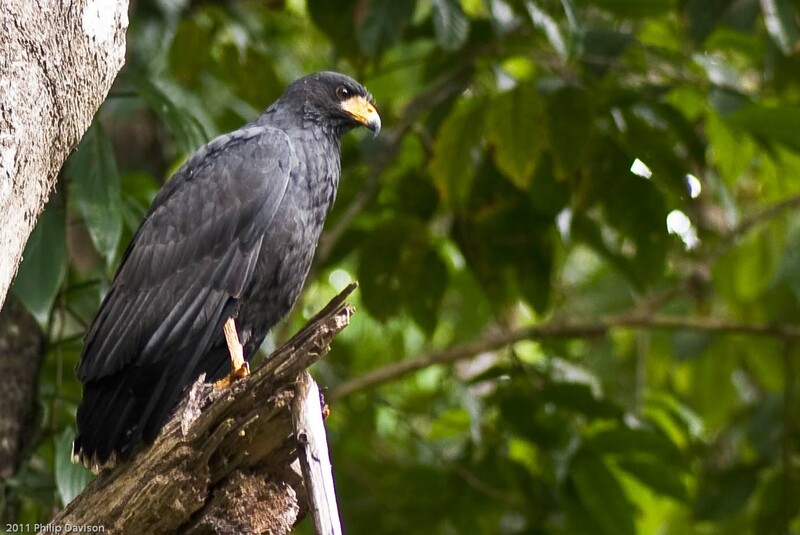 The tiny country of Costa Rica is almost unique in the diversity of its fauna and flora. 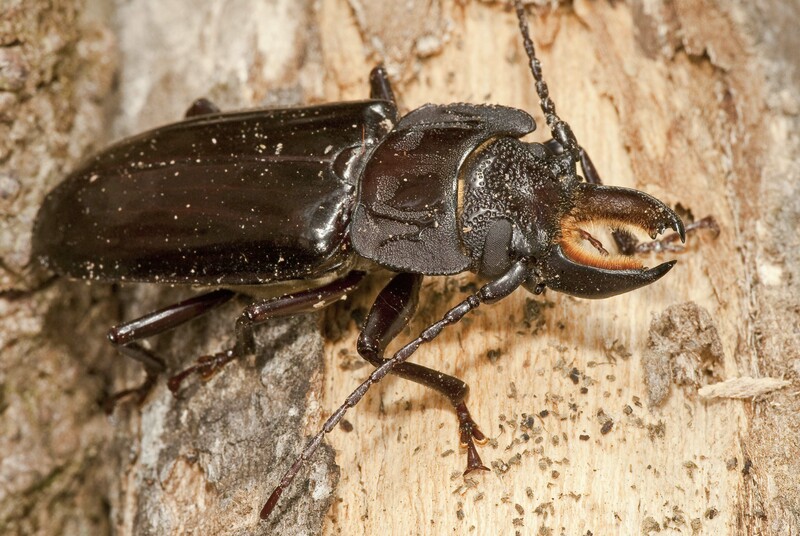 Within the confines of its borders 47,000 species of beetle have been named. 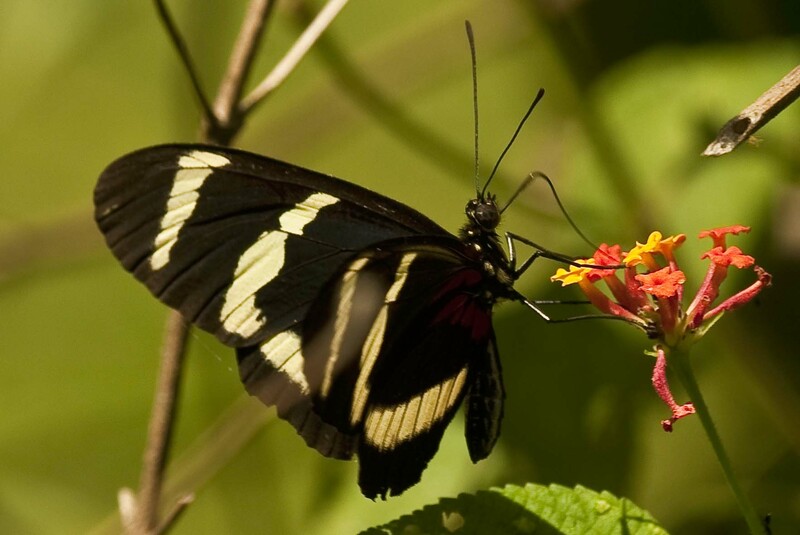 As with many other groups of plants and animals here there is a distinct lack of reference material to help you make positive identifications, and Costa Rica is far better than most other tropical countries at providing keys, guides and references. Anyway, I am happy as a non specialist coleopterist, if I can identify some of my photographic subjects down to family level. 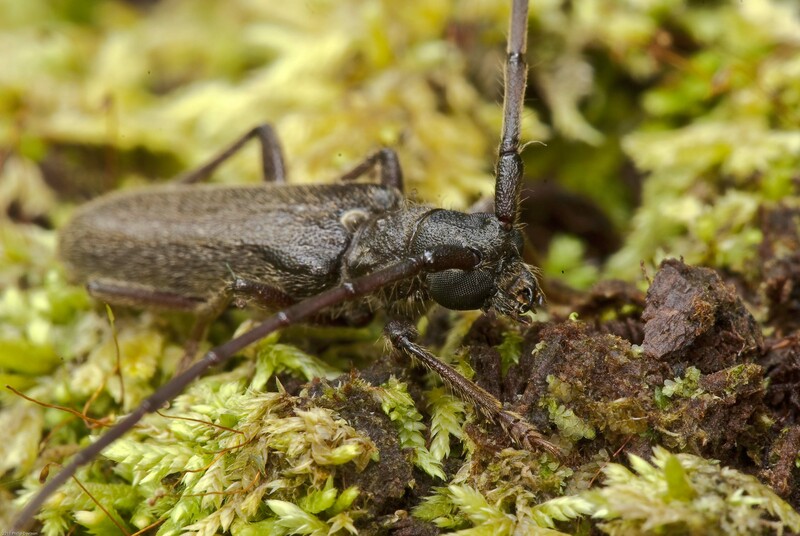 The first two photographs are of two different species of Long Horn Beetle, family Cerambycidae. If the adults are difficult, the larvae are impossible. This red one I am convinced is the larva of a Tortoise Beetle, family Chrysomelidae but I would be happy to stand corrected. I noticed it climbing up a tree trunk and the first thing that struck me was its superficial resemblance to the totally unrelated trilobites that last inhabited the earth 250 million years ago. 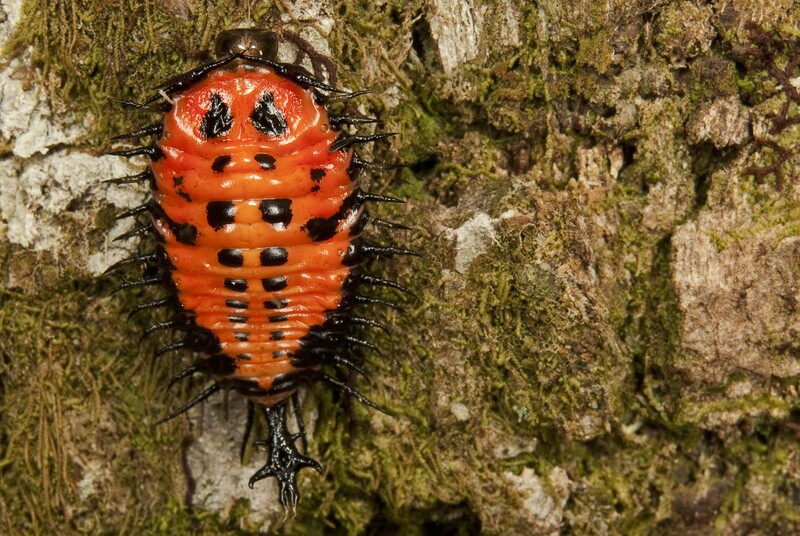 Although we see trilobites as fossils lacking any color, I wondered if it might be that they displayed such flamboyant colors such as this bright red beetle larva. As you walk through the forest, if you care to look at the ground down by your feet, you will become aware of many things moving through the leaf litter. Occasionally a tiny little frog will jump out of your way, only to blend in perfectly with its background. Closer examination will reveal one of several different species. 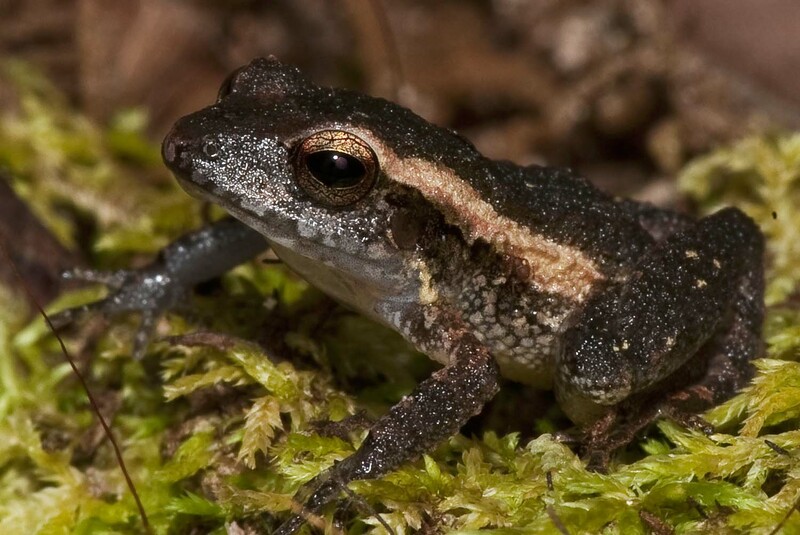 This one is a juvenile Rough-skinned Dirt Frog, (Craugastor rugosus). Close up and in profile leaves you in no doubt as to its name. Finally I have just included some random photographs that I took around the grounds of Bosque del Cabo today just to try and capture the colors of a tropical summer day. Please feel free to leave comments about any of the content, your experiences in Costa Rica or if you think you can provide identies to the beetles. See you next week. Average Daily Temp High 89°F. Average Daily Temp Low 72°F. Average Daily Temp High 31.8 °C. Average Daily Temp Low 22.1 °C.